The Mass Spectrometry Laboratory was established as collaboration between scientists in the WRC and the Michael Smith Laboratories (MSL). This facility also serves as a core analytical laboratory for scientists in the Faculty of Land and Food Systems and the MSL. Lina Madilao manages the Mass Spectrometry Laboratory. Agilent 6890 Gas Chromatograph with Flame Ionization Detector (FID) and Radio Detector and equipped with Agilent 7683 Autosampler (100 sample tray). Agilent 1100 Series LC/MSD Quadrupole SL Mass Spectrometer (LC/MS, LC/MS-SIM for low detection) equipped with Diode Array Detector (DAD) and Refractive Index Detector (RI). Ionization mode: Electrospray (ESI), Atmospheric Pressure Chemical Ionization (APCI), Atmospheric Pressure Photo Ionization (APPI). 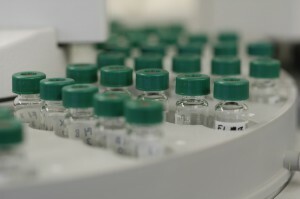 Sample can be introduced via infusion, flow-injection, or on-line HPLC. Agilent 1100 Series LC/MSD Trap XCT Plus Mass Spectrometer (LC/MS, LC/MS-MS, LC/MS-MS(n)) equipped with Diode Array Detector (DAD), fraction collector, and Evaporative Light Scattering Detector (ELSD). Ionization mode: Electrospray (ESI), Atmospheric Pressure Chemical Ionization (APCI), Atmospheric Pressure Photo Ionization (APPI). Sample can be introduced via infusion, flow-injection, or on-line HPLC. Agilent 6890N/5975 Inert XL MSD Gas Chromatograph Mass Spectrometer equipped with Agilent 7683B Autosampler (100 sample tray) and Flame Ionization detector. Ionization mode: EIectron (EI) and Chemical (CI) ionizations. For further information, please contact Lina Madilao directly at 604-822-0386 or 604-827-5578 (fax: 604-822-5143) or by email at madilao@mail.ubc.ca.